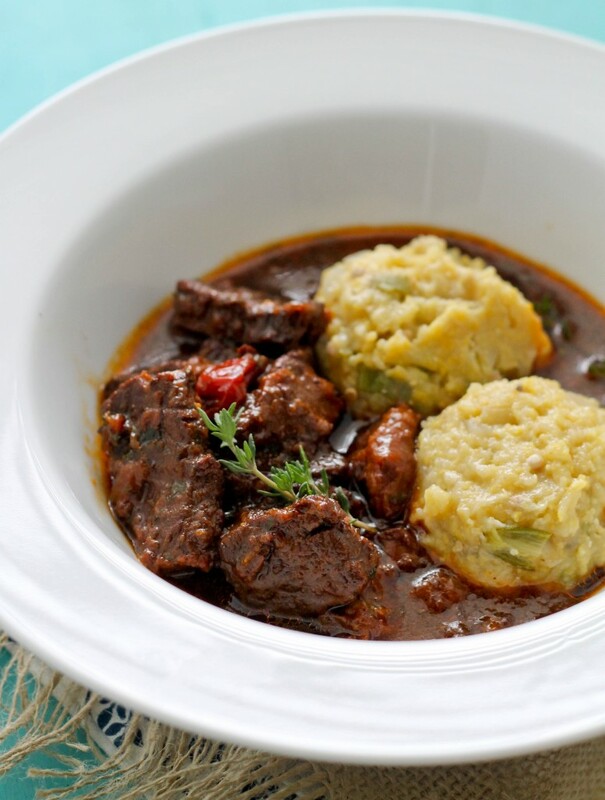 Cou Cou, Barbados’ national dish is made with cornmeal and okra and it’s amazing. 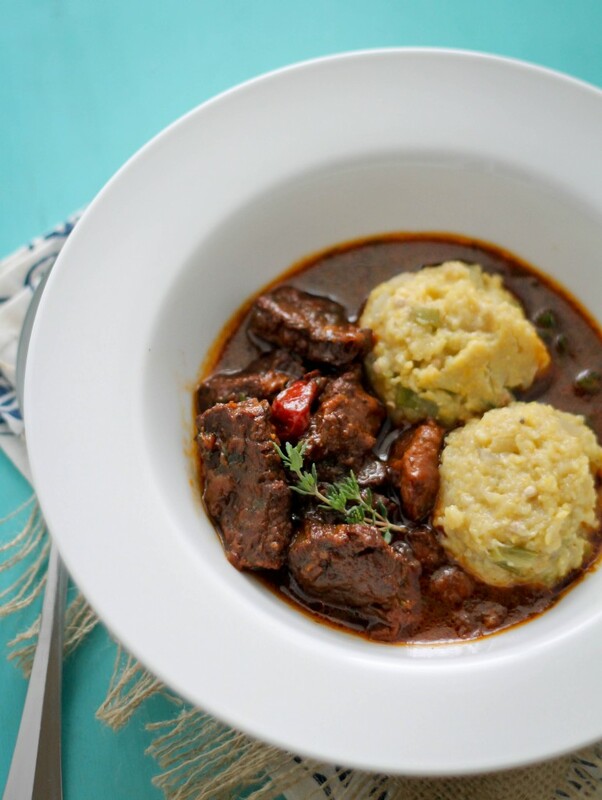 Like many other dishes in the Caribbean, this dish has African roots and is similar to grits or polenta. Savory cornmeal dishes are popular around the world but this has a Caribbean stamp when it comes to flavor. 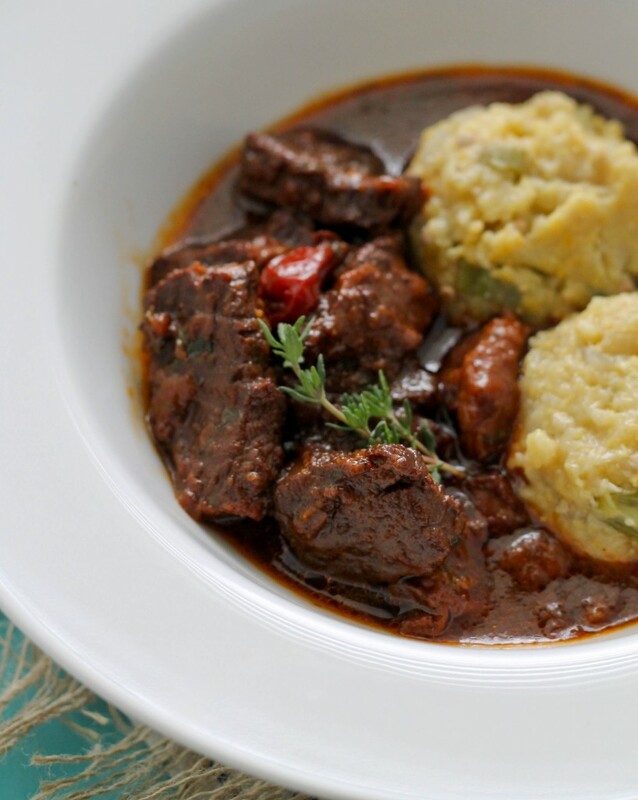 In other parts of the Caribbean this dish is also known as fungi and is usually served with some sort of stew. I decided to make a dark beef stew to go with it because that’s what I felt like having but it would be great with a brown stewed chicken or fish. In Barbados this served with flying fish is their complete national dish. Cou cou has a unique flavor because of the okra flavored broth that it is cooked it. The okra gives it a subtle savory flavor to the dish. Don’t be afraid of using okra, that slippery texture that okra is known for isn’t present in the dish at all! Enjoy! Place beef in a small bowl and season with garlic, soy sauce, Worcestershire sauce, black pepper, paprika, thyme, onion, ginger and pepper. Mix to combine then set aside. In a heavy bottom pot, add oil and sugar over medium heat. Let the sugar caramelize, it will melt then turn dark brown and start to smoke. When the caramel is dark brown (not black) add the marinated meat. Stir to coat and allow it to cook in its own juices until the liquid evaporates. Add tomatoes, tomato ketchup and salt and cook until the tomatoes softens and breaks down the add enough liquid to cover. Bring to a boil then reduce heat and cover pot. Cook until the meat is tender. If the liquid evaporates before the meat is tender, simply add more water. To make cou cou, in a heavy bottom pot over medium heat add oil. When oil is hot add okra, onion, garlic and thyme and sauté for a few minutes until the vegetables soften. Add water and chicken stock and bring to a boil. Cook for about 10 minutes. While the okra cooks, add ½ water to the cornmeal and stir. After about 10 minutes remove the okra, onion and thyme with a slotted spoon and place in a bowl. Slowly add the cornmeal to the pot while stirring. Bring to a boil then lower the heat to low. Cover and cook for 35-40 minutes, stirring every 5 minutes. The cornmeal will thick and the grains will no longer be hard. Add okra and onion mixture back to the pot; add salt and stir. Remove from heat. Allow to cool before serving. I made this dish for my family, and we all really enjoyed it.Thanks.